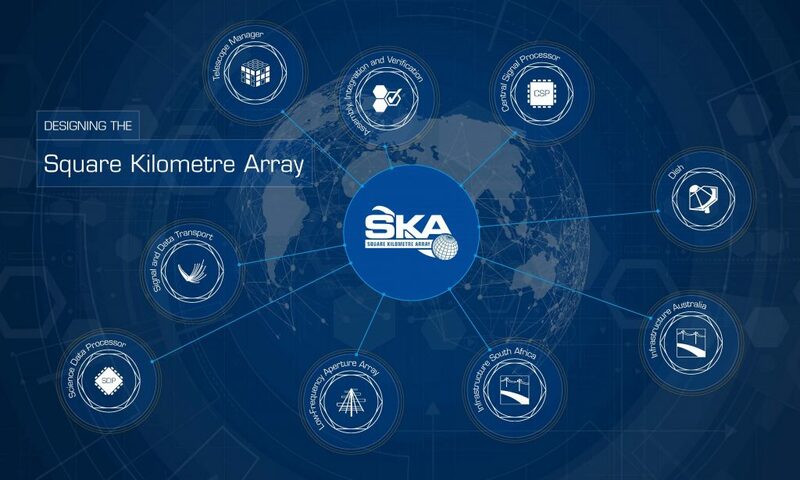 The interactive infographic developed by SKAO showcases the ongoing Critical Design Reviews (CDRs) – key engineering milestones that assess the readiness levels of the major elements of the SKA. Click on the image to access the new platform. SKAO Global Headquarters, Friday 27 April 2018 – The SKA Organisation is pleased to announce the launch of a new platform highlighting the SKA’s key engineering milestones. The interactive infographic will showcase the ongoing Critical Design Reviews (CDRs), which assess the readiness levels of the major elements of the SKA. As well as capturing international teams’ progress towards and beyond their CDRs, the new platform will feature a wide range of news stories, profiles, case studies, photos and videos, providing context on the work that has been done so far. All the CDRs will take place in 2018 and early 2019, with reviewers and engineering consortia members meeting at the SKA’s headquarters in the UK to discuss and assess their proposed designs. The first full review, for the Telescope Manager (the set of software that will operate and monitor the telescope), was completed last week. The CDR platform is designed to be a central hub for updates, chronicling each major step on the road towards SKA construction and showcasing the technological innovations that are making it possible. It will also highlight the expertise and talents of the teams behind that progress. Users will get to know key individuals from the SKA Organisation and its partner institutions in the global consortia through detailed profiles that demonstrate how people – not just technology – are crucial to the SKA’s success. Scientists will be on hand to explain the significance of reaching each target, and how it relates to the project’s key science goals, from looking at how the very first stars and galaxies formed just after the Big Bang, through to understanding the vast magnetic fields which permeate the cosmos. For our industry partners, the platform is a place to highlight their vital contributions to the project, showcasing how their technologies are being used both at this crucial CDR stage and going forward. A key characteristic of the site is that its functionalities will increase over time, just like the SKA itself. As the telescope’s design elements are finalised through the CDRs and towards the System CDR, the infographic will grow its content and capabilities in parallel. The CDRs represent a global effort by 9 international engineering consortia representing 500 engineers and scientists in 20 countries. Since 2013, these nine consortia have been focusing on the main components of the telescope, each essential to the overall success of the project, while three others focus on developing advanced instrumentation for the telescope. The reviews will allow the SKA to fine-tune if needed and then adopt the proposed designs to proceed to construction. Last week’s CDR for the Telescope Manager (TM) element of the SKA went well, according to Prof. Yashwant Gupta, Director of the National Centre for Radio Astrophysics of India and Lead of the TM consortium. “It’s a very good recognition of the work done by the consortium members and by the SKA Office people” added Maurizio Miccolis, SKAO Project Manager for TM. Earlier in the year, the reviews for the four sub-elements of the Central Signal Processor (the pulsar search, pulsar timing, and both the Mid and Low correlator and beamformer) also took place, allowing the overall system design work to move forward ahead of the consortium’s final review.